Over 50,000 Revenue and Customs workers are going on strike in protest at "massive cuts" they claim undermined efforts to clamp down on tax avoidance schemes. 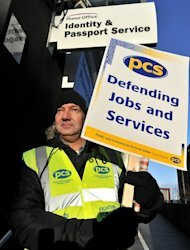 Members of the Public and Commercial Services union (PCS) will take action across the UK, warning that the walkout will close offices and leave telephone calls unanswered. The union said 30,000 jobs have been axed since 2005 and a further 10,000 are set to go, "undermining" efforts to investigate schemes such as the one used by comedian Jimmy Carr, which sparked a political row last week. The strike is also in opposition to "creeping privatisation" in the department, which is currently trialling the use of private firms to handle tax credit inquiries. PCS general secretary Mark Serwotka said: "It is sickening to see millionaires in the cabinet wringing their hands about the immorality of tax avoidance when it is their lack of political will to act that means we lose tens of billions of pounds every year. "The case for investment in our public services as an alternative to austerity could not be more obvious than it is in HMRC. Yet the government wants to cut 10,000 more jobs from the department, letting the wealthy tax dodgers off the hook and punishing the rest of us for a recession we did not cause." An HM Revenue & Customs spokesman said: "HMRC is disappointed with the decision to strike and will do everything it can to maintain services to the public. We are seeking dialogue with the PCS to address their concerns and will work to minimise any disruption to our customers. "In our 2010 spending review the Government made £917m available to us to tackle avoidance, evasion and fraud. This is being used to increase our tax take from compliance work by £7bn a year in 2014/15 which we are on target to do. Last year alone we increased the yield from our compliance work to £13.9bn."